For most organisations project reporting seems like a huge challenge. Often they spent lots of time and money on systems to try and make it work. But in practice they could be missing a simple hack to fix it. And even better that solution could be free. So how do they get free project reporting and improvements in quality at the same time? Their answer is rather simple, Planner. As you will have seen in previous posts Planner is great at collecting information about Plans, tasks, costs, risks, issues and changes. We also looked in the last blog post at how views can give project analysis outputs. You can use all this in producing your free project reporting. Planner gives you two ways of producing the reports, either standard to print or manual. Lets look at standard to print first. Here you use the print options form to choose which content you want and also to set style. You can choose the mix you want of tasks, risks, issues and calendar and milestones timelines. Using your current view in each area those data blocks will be packaged into a document for printing. Or of course you might choose to print to PDF instead. This approach is quick and hassle free but limits the report to one block of each type. 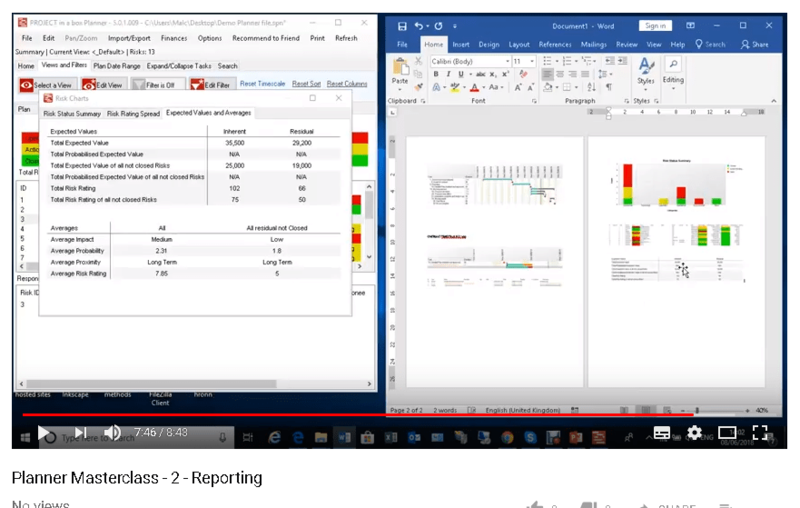 If you use the manual approach, you can assemble your own report in Word or Excel with as many sections/blocks as you want. This will take you a bit longer but give you the same sort of outputs for free that our commercial users obtain. Choose your preferred view in the data area and then right click to copy as either image or data table. You can then simply paste where you want in your report. With this you can change view and copy paste again. Thus you can have many different types of analysis in the same report, just like commercial customers get. Our helpful Planner masterclass video takes you through all of this. You can see it here on You Tube or on this site here. Planner is free and it isn’t a trial. And because it is a product you download and install on your laptop once you have it you can continue to use it forever. Your reports will look much better and those dangerous quality errors will have been eliminated. So why not share these benefits with your colleagues, you could all be using Planner to deliver better project reports. You can sign up for your free Planner download here.